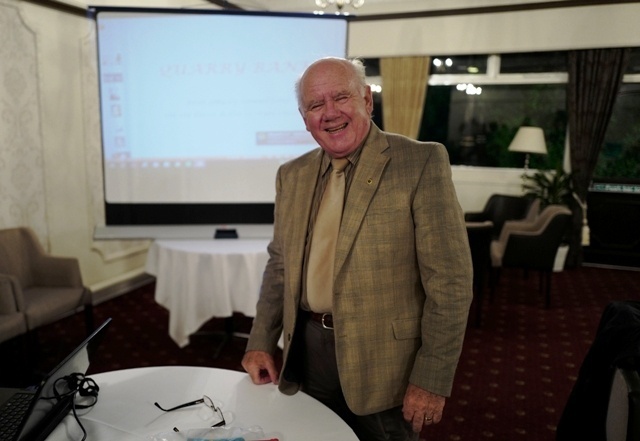 19 August 2014: Member Bernard Davies gave a short PP presentation of his exciting afternoon at RAF Coningsby, the base for The Battle of Britain Memorial Flight.which includes the one airworthy Lancaster in the UK. Bernard was privileged in being invited by Pilot Flt.Lt Roger Nicholls to inspect the inside of this legendary aircraft. Here below are a few pictures taken of this memorable experience. Bomb doors open Bernard as "Tailend Charlie"
On the same evening, we were visited by Ashley Tevault, from Colorado USA. 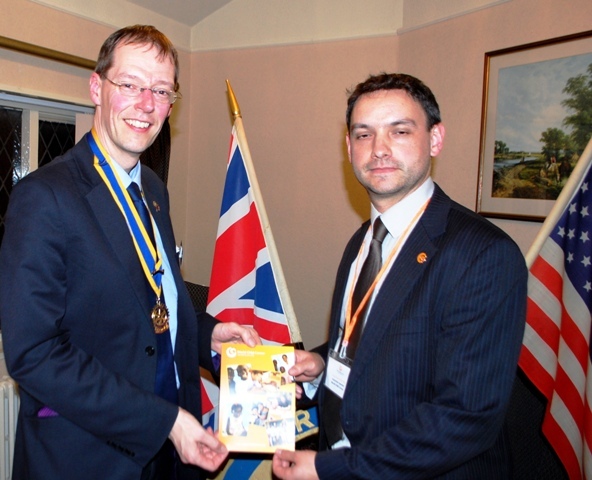 A former Ambassadorial Scholar amd now an Honorary Rotarian. She will be joining he Peace Corps in West Africa. In her presentation on the ctivities of the Guides movement.she included that being a member of the Guides in her earlier years had improved her job opportunities and recommended others to become members. 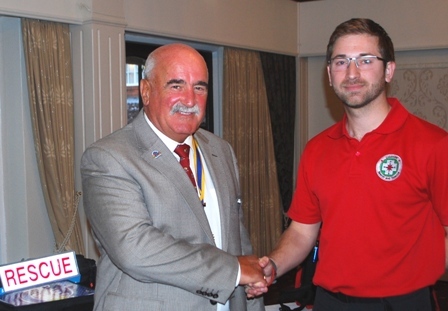 District Governor Alastair Bain (Left) and our speaker for the meeting Business Development Manager Paul Whittaker from Big Storage Group were with us on 23rd September. 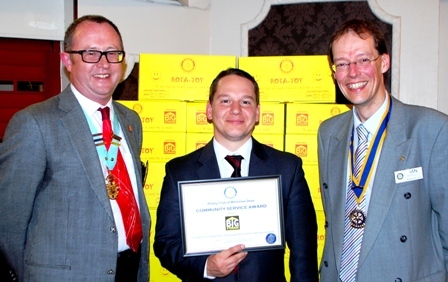 In recognition of assistance by Big Store with our Rota-Toy campaign, Paul was presented with a Community Service Award by President Ian Bradley (right). In thanking the club for this award, Paul commented that he hoped that the branch . 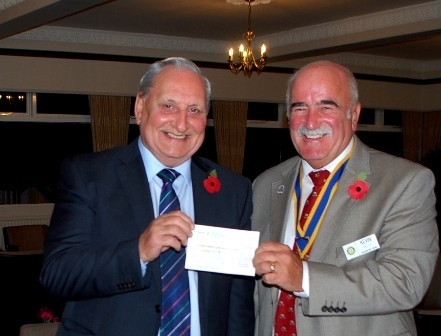 could work alongside the Wilmslow Dean Rotary Club and be of further help in the future. Speakers tonight were Crystel Berridge and Anne Dawson from Hampers of Hope. Hampers of Hope is a Christian charity with the aim of relieving poverty and restoring hope in North East Cheshire. Since 2011, it has helped local people through the work of its foodbank, money management courses, job clubs and Hope Centres. For more information about Hampers of Hope call 0800 1114986. On the 2nd. 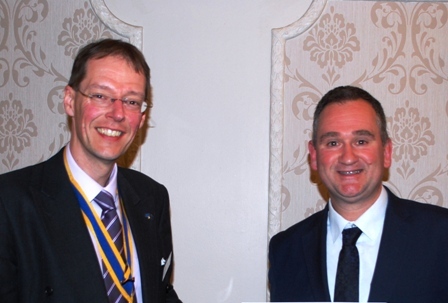 December our speaker was Paul Hammersley. living .in the low and middle income countries in the world. 20th January 2015. 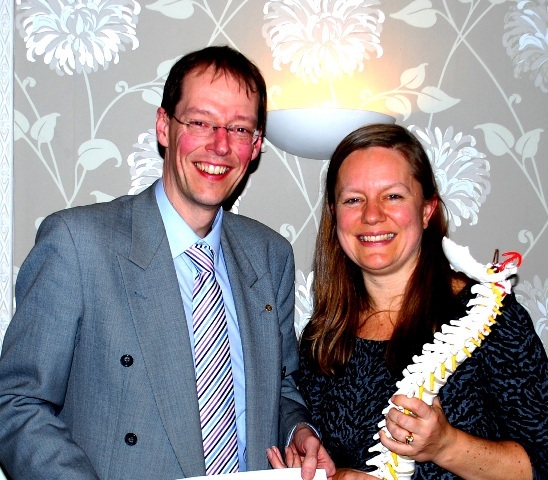 Dr. Rachael Talbot a practicing chiropractor, talked to us about her profession and the many benefits that can be achieved for the relief of pain by the modern treatments to the spine. Town Manager for Cheshire East Council. .Pictured above with President Ian Bradley, Dianne reviewed her work in Wilmslow since 1988 and spoke of the business and cultural changes now influencing the vitality of all town centres. 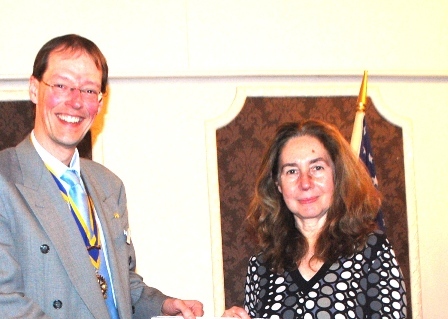 pictured above with President Ian Bradley. Known as "Open Arms Village".Tthis is a safe fanily environment for100 children. most of whom have been orphaned,abandoned or removed from their homes due to neglect or abuse. During the group's charity work in Kenya, Ian provided 600 pairs of glasses to people from a nearby slum. as a donation to this worthy charity. 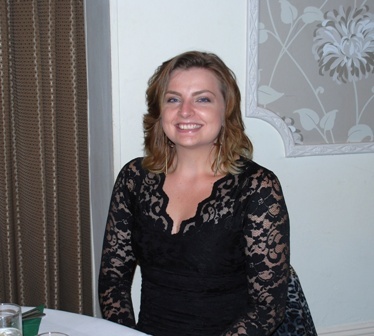 Business Development Co-ordinator from Pettypool Trust. 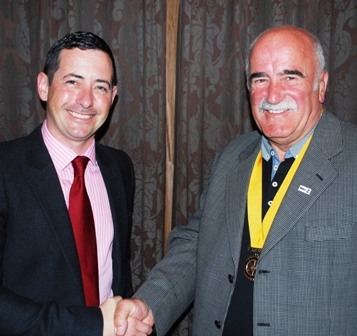 Pictured below (Left) with Rotarian Vice President Kevin Kelly. to students from Cheshire, Warrington and Halton. to Schools, Colleges and Businesses. On this evening there was a double occasion. 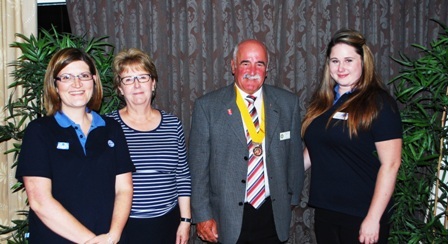 The Rotary Club of Handforth and Heald Green now renamed Wilmslow Dean. 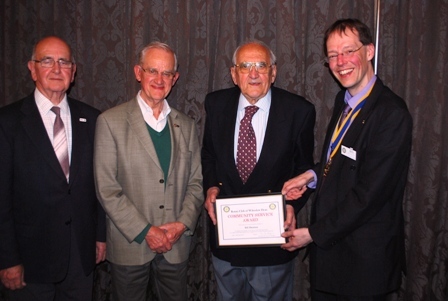 Bill was presented with a Community Service Award for his valuable service and support to the Rotary Club albeit having left the club due to business reasons. culminating with his position as Market Manager Stockport. 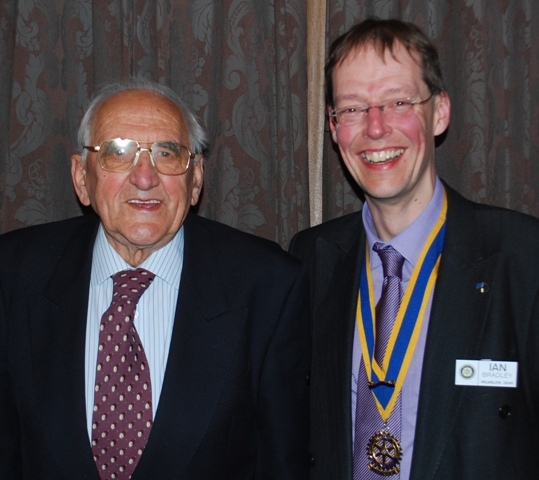 John Grainger with President Ian. President Kevin Kelly Welcomes our guest Mark Susca from Cheshire Search and Rescue. Mark gave us a detailed presentation of the work of this splendid volunteer group, with a slide show. Mark brought with him a selection of the equipment the group uses. Our visitors here are two Rotary Ambassadorial Students from Manchester University. Mai Kataoka from Japan 3rd left. 16th August, we were pleased to welcome speaker Peter Webb, a geologist, who gave us a talk on the pros and cons of Fracking. He was able to giv eus unbiased responses to the many questions posed by the members. 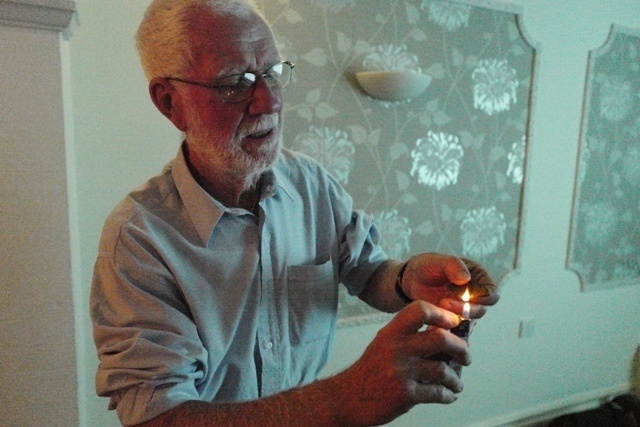 Pictured below, Mr Webb demonstrates the gas hidden within a specimin of shale, by literally igniting the gas within. 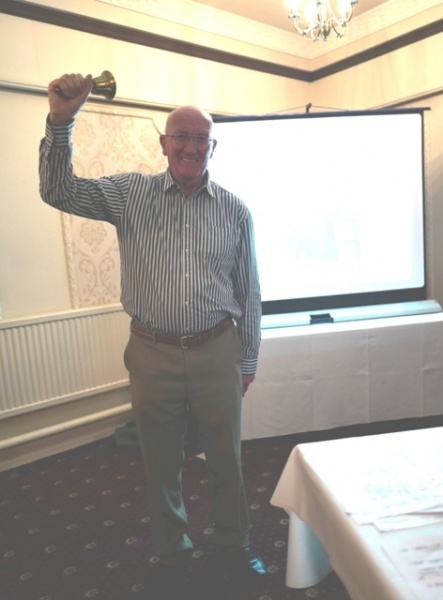 Club member Rotarian Reg Lord demonstrates his bell ringing technique during a talk he gave the club on his former role as Town Crier for Chadderton.